A bassinet crib for the youngest babies. 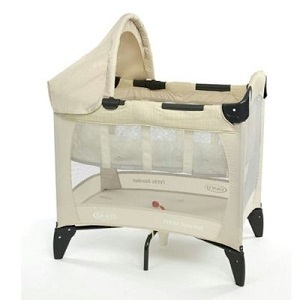 DescriptionGraco Petite Bassinet crib, for infant and baby up to 9 months. With infant and new born raised bassinet. 20% smaller than full sized portacot. 7 feet for perfect stability. Suitable from birth up to approximately 9 months old (maximum 9 kgs). Raised bassinet is suitable for babies up to 6,5 kgs (approx. 3 months). Rented with matress protection and cotton fitted sheet. Fixed delivery and collection fees: 20 € for Paris and surroundings (extra fees € for CDG and Orly airports, Eurodisney). This bassinet crib is ideal for an infant or new born arriving in Paris for few days. Compact and light, baby will feel in confidence, not been "lost" in a full sized travel cot. Equipped with a booster bassinet - allowing parents to take baby without having to go up to the bottom of the bed - its compact shape allows you to install it in a small sized room or next to parents bed. When baby grows up, you'll be able to use it without the booster mat. Its mesh sides allows you to see baby from all sides. All our portacots are delivered with matress protection and fitted sheet. This product has been newly added to our range of baby equipment for rental. It has not been commented yet.